Anyone who has known me for any length of time knows that Whole 30 is not something I would normally do. I love food and I want to eat what I what, when I want it. 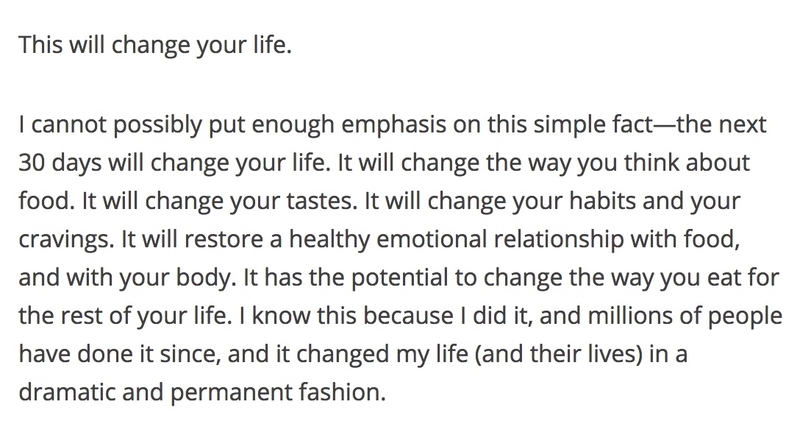 Regardless, Whole 30 has been something that has been on my mind for a few years to do as a reset and a way to take a step back from the way I’ve been eating for so many years. I know my body hasn’t been happy; I’ve had unexplained shoulder and hip pains since age 17, stomach aches, and have been gaining weight slowly for the last ten years. I know to lose weight you have to eat right and exercise. I hate exercising and when it came down to picking out a healthy meal I just didn’t know where to turn. I saw a nutritionist briefly shortly after moving to Seattle but that didn’t help at all. Joe came home one day in June saying that he wanted to do Whole 30 based on his doctor’s recommendation (and he has heard me mention it for a few years). I got excited. I knew I wouldn’t be working past June and that I could handle it if all I had to do is focus my time on making complaint meals. We decided to start on July 5th so we could still have a cook out on the 4th. I made way too much food the first week and we had tons and tons of leftovers. The recipes in the Whole 30 Cookbook made a lot and I should halved them for just the two of us. I also had some consistency issues with the cookbook but if you’re careful to read through the recipe fully before starting you should be fine. This additives download was a lifesaver while grocery shopping. You definitely need to do your research before starting Whole 30 and you have to read all ingredients. The Life Health HQ website was also a big help, especially with their Larabar guide. Throughout the 30 days I was pleasantly surprised to find that I had already been doing a lot of things right, I just needed to focus on eliminating my unhealthy habits. No more drive-thru cookie runs, cupcakes, or default pasta dinners. 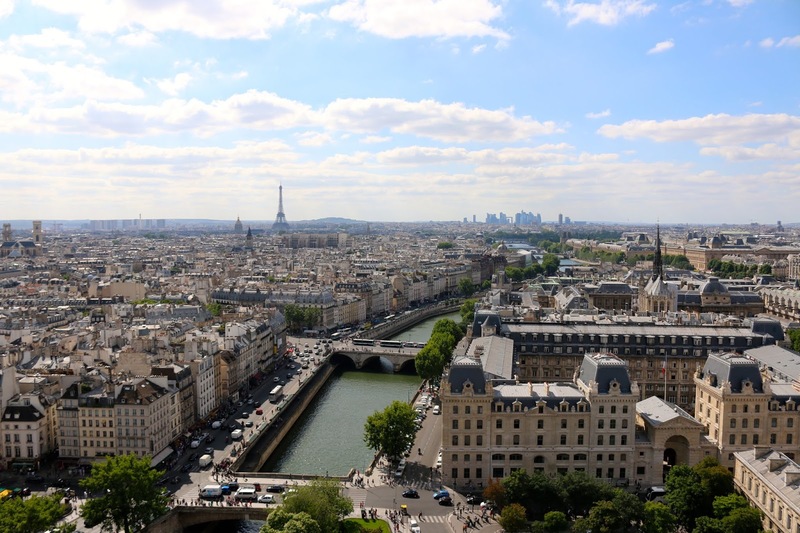 I was able to still turn to one of my go-to food bloggers, Clotilde, for favorite recipes like Charred Broccoli and Avocado Salad, Carnitas, and Spiced Carrot and Ground Beef Stir-Fry. I was so excited to find that my new-found recipe for homemade taco seasoning is compliant (Read your labels! Even for spices). The foods I missed the most were sushi, pizza (weird because I don’t usually crave pizza), pasta, and bread. My go-to breakfast was a variation of one I had previously done quite often: roasted sweet potatoes and fried eggs. Cube and roast a few sweet potatoes tossed with oil, salt, and pepper at 400F for 40-50 minutes, flipping halfway. Each morning I put however many I want into a pan and heat with coconut oil (and maybe leftovers like onions or mushrooms). When they’re hot I move to a plate and fry 2 eggs. The perfect breakfast. We found new favorite recipes like sweet potatoes with cashew sauce, Bacon and Avocado Zucchini Noodles, and Shrimp and Sausage Skillet Meal, though probably the favorite recipe for both of us is the braised short ribs from the Whole 30 Cookbook. I made that several times. I even put my kitchen brain to work and created my own tuna salad. On Bastille Day, July 14, I made this French Potato and Tuna Salad. 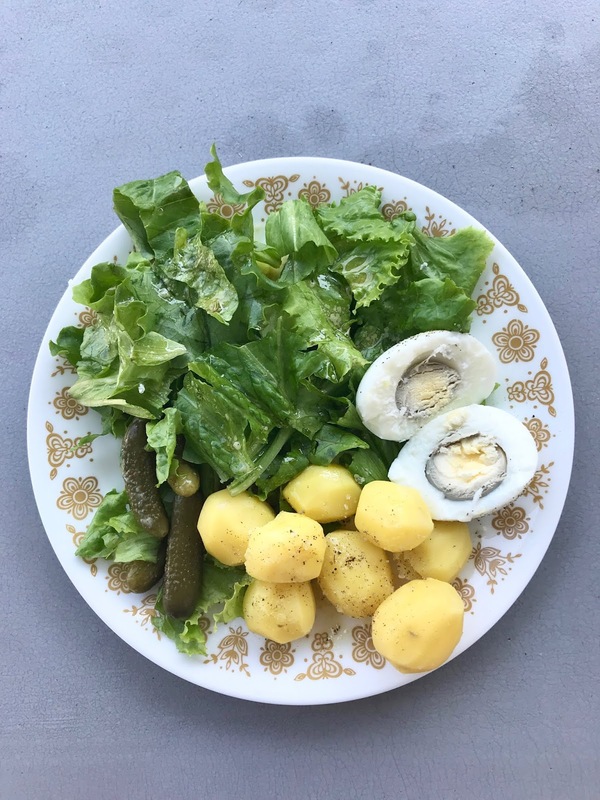 I had the leftovers with a side salad and cornichons and it was one of my favorite meals of the month. I was also amazed to discover that the milk and butter I had always added to mashed potatoes is completely unnecessary. All you need is to scoop out some of the starchy water (1-2 cups) before you drain the potatoes and add that to them as you mash. I kept a food log for all 42 days. I didn’t want to include it here because it is a lot, but if anyone is interested let me know and I can do a separate post. 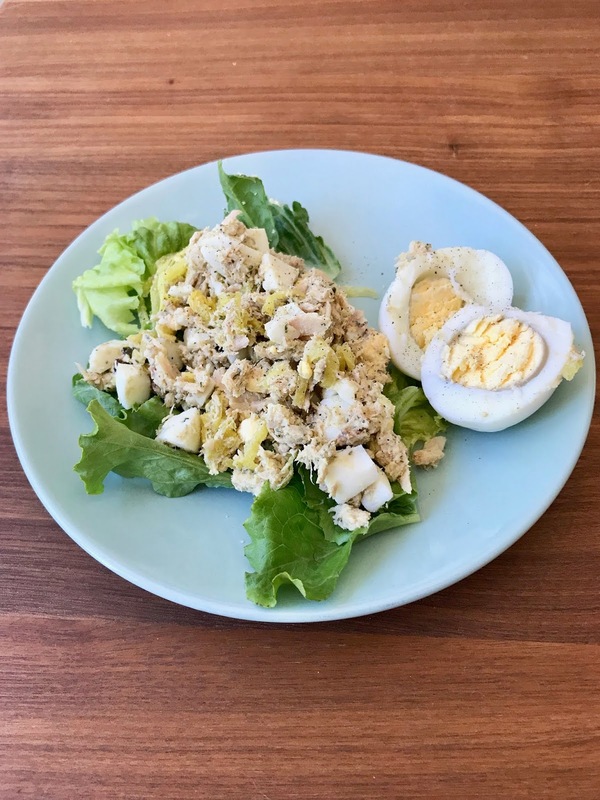 My tuna salad with green lettuce and a hard egg. 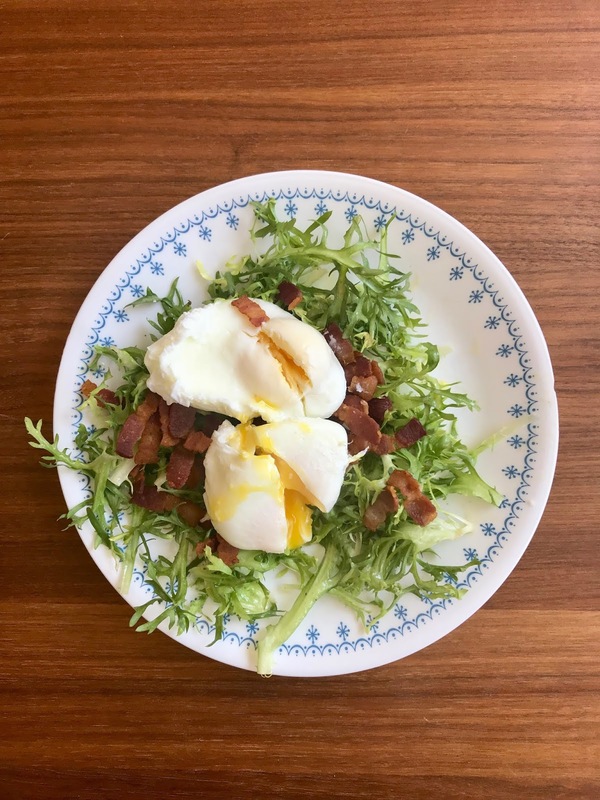 The bistro breakfast salad from the Whole 30 Cookbook. 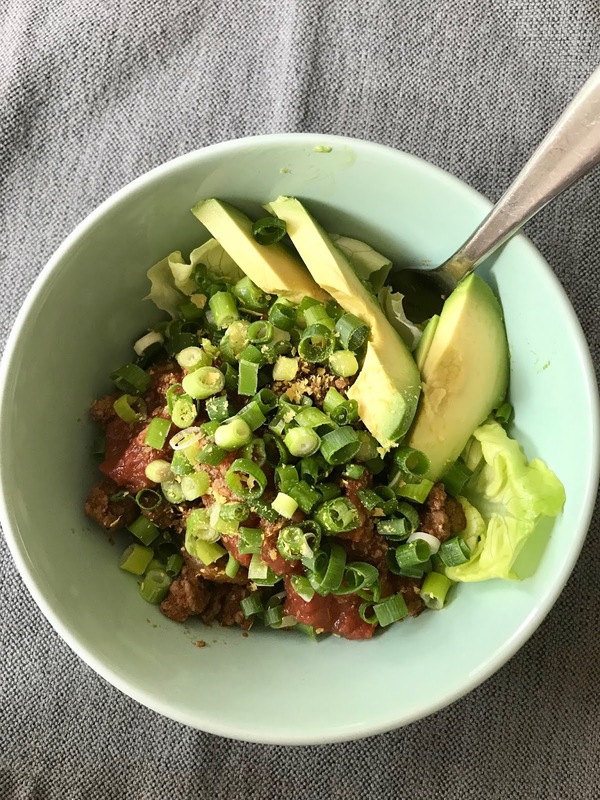 Leftovers with butter lettuce, taco meat, green onions, salsa, and avocado. 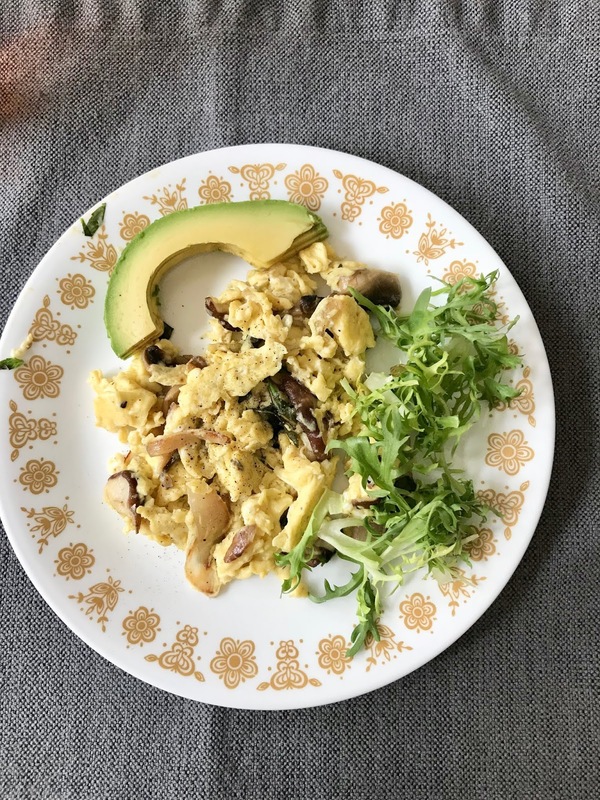 Egg scramble with mushrooms and shallot, frisee, avocado. I kept waiting for the dreaded lethargy, headaches, and food hangover that everyone talks about having the first week or so. They never came and I felt great for the entire 30 days. Joe said he didn’t have the energy for his usual workouts but other than that he felt good. When your 30 days are up they recommend introducing each group you eliminated one by one to see their effect on your body, which we did. We chose not to reintroduce alcohol. For dairy we already knew we had a lactose sensitivity so we only reintroduced items that we ate before, like hard cheeses and butter. Dairy, non-gluten grains, and legumes were introduced without issue and we had minor side effects from gluten. After each reintroduction you do two more days Whole 30, so the whole program in total was 42 days long for us. As I said at the beginning, I did weigh myself even though they say not to. After 20 days I was down 10 pounds. At 30 days I was down 12 pounds, and at the very end my total lost was 15lbs. I decided to make an appointment with a nutritionist to see how my food log was looking and what a balanced died would look like for me going forward after Whole 30. I also discussed some stomach sensitivities I’ve experienced while on this diet and we suspect I am sensitive to high FODMAP foods, which is a big fat bummer but something that can be worked with. My biggest take away from doing this is that now I know what to cook and eat to be healthy and feel good. I know what meals and ingredients to turn to on a regular basis and what foods I need to have less often. I also have a great food log to reference when making menu plans. These days I rarely snack and find myself eating way less food. I’m also noticing that I can go longer between meals. We both plan to keep eating a mostly Whole 30/Paleo diet but with a small amount of non-gluten grains and dairy, with a limited amount of gluten. I’m already exploring non-gluten pastas and other healthy “Paleo” alternatives to common foods and meals. I bought a Spiralizer and have been using my Vitamix more than I ever have. I’ve started doing Yoga at the recommendation of my nutritionist and surprisingly, I love it. I’ve been doing it about five days a week and I really look forward to it each day. Blogs I have been turning to the most are Minimalist Baker, The New Baguette, and of course Chocolate and Zucchini. I hope this was an informative post for anyone looking to do Whole 30. Please feel free to email or leave a comment with any questions.